Incat's world beating Wave Piercing Catamarans are created through a production line system at the dedicated 70,000m2 undercover facility. Up to six vessels can be handled simultaneously in two drydocks which includes the ability to house construction of larger vessels up to 150 metres in length. Like any thriving business, a core of dedicated and loyal staff can be found at the centre of Incat’s success. With high levels of job satisfaction, Incat ensures a low staff turnover rate and a skilled workflow where many team members’ experience stretches back over two decades across a range of trades. Incat is proud to count the world’s finest skilled technicians amongst our workforce. High performance vessels require high quality welding and the training of welders, development of appropriate welding procedures, and advanced testing techniques are essential to Incat’s continued success. The purpose-built TAFE College of Metal Fabrication is situated adjacent to the yard for even greater convenience. High-strength marine grade aluminium alloy, sourced in structural sections and plate from specialist suppliers in Australia, France and Switzerland, arrive at the plate shop where it is purpose cut using software proprietary to the cutting equipment on site. Nesting plans are generated to extract a useable part from every stock piece of material. The Inches shed is mainly used for manufacturing of vessel components and it is to here that materials are delivered from the plate shop ready for pre-fabrication. This is also where the smaller vessels are constructed. The benefits of pre-fabrication are immense. Components can be rotated and by selecting orientation, the number of down-hand welds can be increased which in turn shortens welding time. 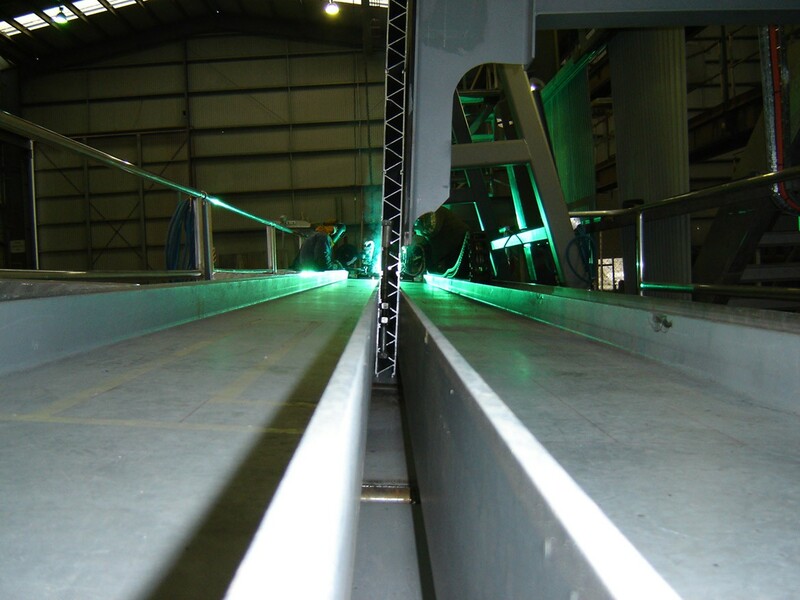 Bulk plating, where the longitudinal structure extrusions are welded to the shell plate, means that welding is only required at transverse frames when these units are lifted into position. Continued refinement of the pre-fabrication and module construction process has seen the stage 1 positions of both the main assembly halls transform into pre-fabrication areas for large components such as fuel tanks, engine rooms, jet rooms and superstructure modules. 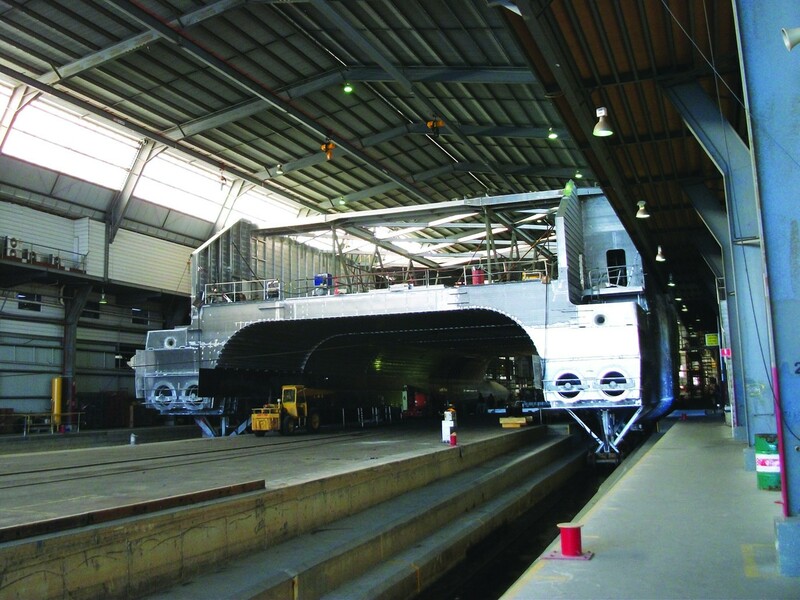 Modules completed at the various pre-fabrication locations at Incat are then transported and positioned in stage 2 of the construction hall applicable to that series of vessel. Construction begins in the centre of the vessel allowing rapid growth, in a controlled manner. 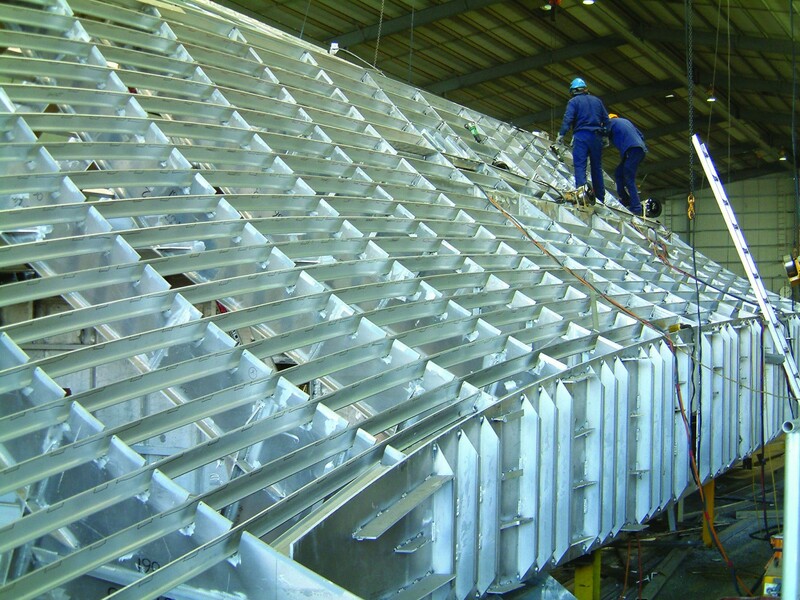 As the fabrication & welding teams progress throughout the vessel, our quality assurance/control departments and survey authorities check and approve the completed structure. On completion of this process the fitters, fitout electrical and electronic teams move in and install services and equipment. The vessel continues to grow in this position until it is approx 70% of its completed light ship weight, at which time the vessel is rolled back to the next stage of the production sequence. With stage 2 cleared modules for the next new build are able to fill this spot. 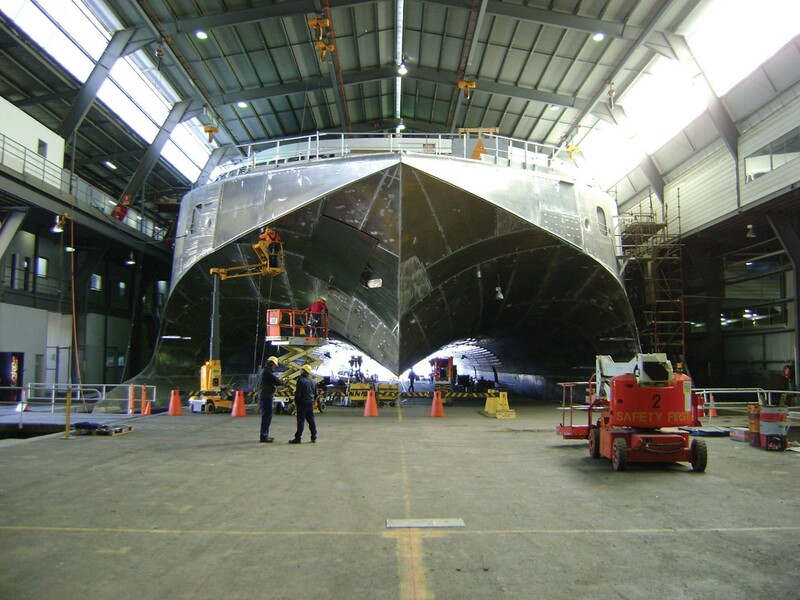 With the vessel in its final stage before launch the forward end of the vessel is completed and the unique Incat catamaran shape becomes recognisable. At this stage main machinery such as engines, jets, thrusters,T foils are installed. Once the equipment is carefully positioned and secured the vessels’ structure is closed off for the final time and painting and livery requirements are addressed. The majority of the fitout work is completed by the yard’s highly skilled tradespersons in the stage 3 position. Fitters, plumbers, electricians, electronics, fitout, hydraulics, pneumatics, painters and structural fire protection personnel all set about completing the various components and systems on board the vessel. With engines installed the vessel is ready for launching, once clear of the shed the radars and aerials are fitted and final commissioning of systems takes place. Builder’s trials and sea trials for the customer are completed and the vessel is ready for handover and delivery to her new home.